For those who are in debt with little assets like me they may agree there’s nothing that’ll bring down your financial ego more than after you calculate your net worth. Side note: I used to think only rich and famous people had a net worth. This stemmed from my former belief that not everyone has the opportunity build wealth. Wow, how naive! Net worth is a true indicator of wealth, not income. Someone who earns 6 figures a year can still have a negative or $0 net worth if they have more liabilities than assets. Read more about liabilities and assets here. A liability is a financial obligation to another such as a bank or other lender. Examples include credit card debt, student loan debt, a mortgage, and car loan. An asset is something you own that has monetary value. Examples include cash, savings, retirement accounts, cars, and jewelry. It wasn’t until I sat and analyzed my spending habits that I realized why my money was unmanageable. I then was able to identify the problem areas and cut down on monthly expenses. Read about what I no longer spend money on here. Everyone who is successful with their money has a budget. Even small businesses and Fortune 500 companies can’t function without one. Read about Zero Based Budgeting here. Arguments exist saying there is good debt and bad debt. People tell me my student loan is considered “good debt.” These people also don’t have student loans, so I don’t believe them. Minimize the use of credit or loans, especially for consumer debt such as a car loan or financing any purchases. One of my favorite books is The Millionaire Next Door by Thomas J. Stanley, Ph.D. Hundreds of millionaires were interviewed for this book. All of them are extremely frugal and none of them ever borrowed money. Riddle me that! When I graduated I had no assets and a whole ‘lotta student loan debt; my net worth was -$180,000. Ain’t that a shame. As I slowly chip away at my loan it pleases me to see my net worth creep up out of the negatives. Fidelity recommends to save 5% of each paycheck. Read about the 50/15/5 Guide here. Aim to have 3-6 months’ worth of expenses saved for an emergency. This prevents the habit of having to use credit cards or take out loans to get out of a financial emergency. In an article by CNBC published in July 2018, it states only 29% of Americans have 6 months worth of expenses saved. 55 million Americans are without an ample emergency fund. Would you or your household be able to live off of your savings if you missed a paycheck or two? Contribute to retirement accounts as soon as possible. The recommended contribution is 15%. According to The Balance Financial Planning, one should have equivalent of half their salary saved in their retirement accounts by age 30, twice equivalent by age 40, 4 times their salary by age 50, and 6 times their annual salary by age 60. By the time of retirement the goal is to retire as a millionaire! Imagine the feeling! For Millennials with debt it’s understandable how difficult it may be to contribute the maximum amount especially for those with other financial obligations like children or a mortgage. In this case, any contribution is better than nothing. Everyone’s retirement goals are different. It may seem difficult to gauge what we’re aiming for in retirement so early in our lives, but it’s extremely important to plan ahead and start as soon as possible. The value of your assets may fluctuate over time. The stock market will reach its peaks and valleys and the value of your car will decrease. Check in with your assets, reevaluate them periodically. Intuit Turbo summed up the average net worth of families by age as reported by the Federal Reserve from 2016. Read this article here. Use the net worth averages above as an eye opener and nothing else. It’s hard not to feel bad when other people are building wealth while I’m still paying off my loan. However, net worth is a personal thing. Don’t go comparing your net worth to others unless you want to make yourself look bad! This should only be a measure against yourself. Also remember that whatever it may be, you are always worth more. There’s no number that can quantify your mind, your being, your contributions and your talents! Tracking your net worth will serve as a guide for your own financial goals. 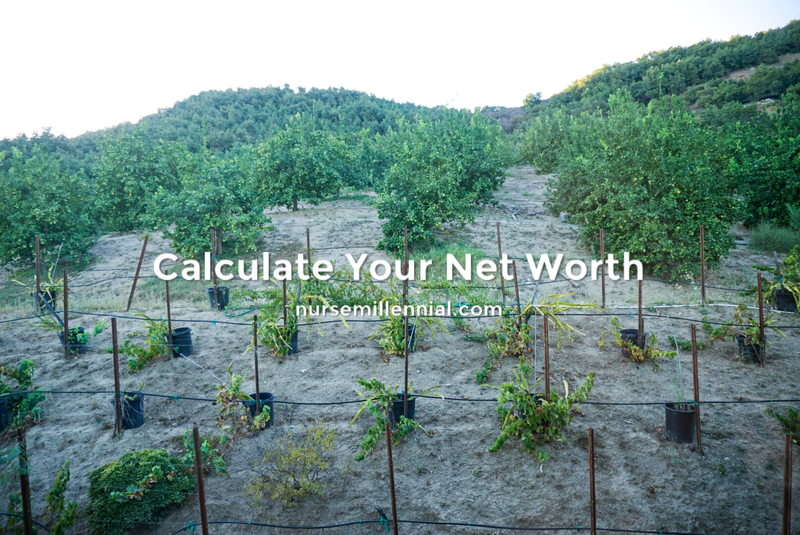 Calculate your net worth by using this guide here. Reevaluate frequently to check progress, evaluate expenses, and adjust accordingly. Evaluate your personal net worth; are you better or worse off than expected? What will you do to increase your net worth?